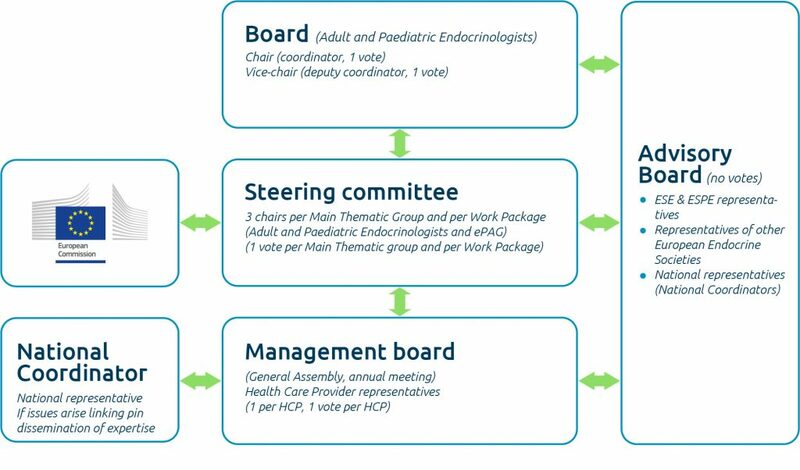 The board consists of the Chair and Vice-chair of Endo-ERN. Covering adult endocrinology and paediatric endocrinology, each with equal right. Their role is to coordinate all activities of the Steering Committee, to organise and chair the Steering committee meetings and the general assembly, and to function as infomation link between Member States and the European Commission and between ERNs. The Steering Committee includes all main thematic group chairs and work package chairs. 13 permanent votes. Each MTG and WP is led by three chairs – one paediatric, one adult physician, and ePAG patient representatives. This ensures active patient involvement in any strategic decision and action. The management board consists of 1 representative per Reference Centre. The Advisory Board will consist of representatives of ESPE and ESE.